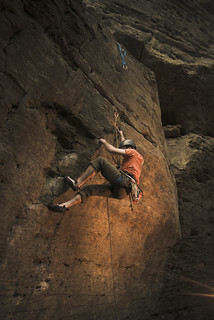 My friend David sending "Beta Spewer" 5.10b in the Muir Valley at the Red River Gorge in Kentucky. Strobist: SB600 on camera right with full CTO gel. Manual full power. Triggered by CLS. This the first 'strobist' photo that i've taken and am excited about. What do you all think? I'd appreciate your feedback. Thanks!